With its ferny foliage and umbrella-shaped clusters of blooms, Queen Anne’s lace is pretty and a few random plants cause few problems. However, a lot of Queen Anne’s lace can be a major cause for concern, especially in pastures, hayfields, and gardens like yours. Once they get the upper hand, controlling Queen Anne’s lace flowers is extremely difficult. Wondering how to control Queen Anne’s lace? Read on to learn more about this challenging plant. A member of the carrot family, Queen Anne’s lace (Daucus carota) is also known as wild carrot. The lacy leaves resemble carrot tops and the plant smells like carrots when crushed. Queen Anne’s lace is native to Europe and Asia, but it has naturalized and grows across much of the United States. Because of its large size and fast growth habits, it poses a considerable threat to native plants. It will also choke out flowers and bulbs in your garden. Controlling wild carrot plants is difficult because of their long, sturdy taproot, and because it has so many effective ways of reproducing itself far and wide. Queen Anne’s lace is a biennial plant that produces leaves and rosettes the first year, then blooms and sets seed the second year. Although the plant dies after setting seed, it ensures that many seeds are left behind for the coming year. In fact, one plant can produce up to 40,000 seeds in bristled cones that stick to clothing or animal fur. Thus, the plant is readily transferred from place to place. Hand-pull plants before they flower. Try not to leave small pieces of root in the soil. However, the roots will eventually die if the tops are continually removed. Mow or prune Queen Anne’s lace before it flowers and sets seeds. No flowers means no seeds. Till or dig the soil regularly to prevent young sprouts from taking roots. Don’t attempt to burn Queen Anne’s lace. Burning just encourages seeds to sprout. Use herbicides only when other means of control are ineffective. Check with your local cooperative extension office, as the plant is resistant to some herbicides. Be patient and persistent. Getting rid of wild carrots won’t happen in a single year. 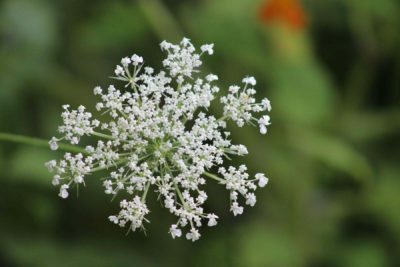 Read more articles about Queen Anne's Lace.